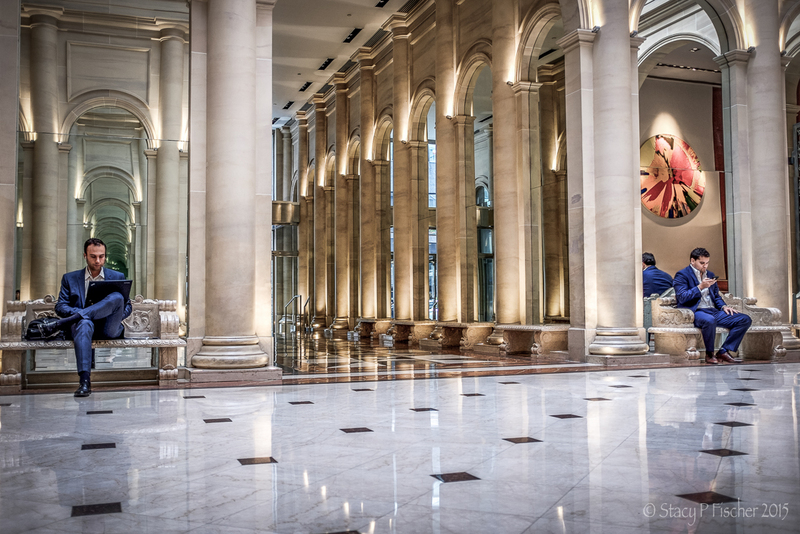 (4 photos) Two weeks ago, I excitedly returned to New York City for another round of WordPress photographer/blogger meet-ups. Arriving Tuesday afternoon, I spent my first night in the company of Robin Kent (PhotographybyKent). Robin wanted to shoot the reflecting pools at the 9/11 Memorial; since I missed photographing these at night the last few times I was there (the lights are turned off at 9pm), I was keen to join in. Looking across the South Tower Pool to One World Trade Center and the 9/11 Museum (lower right). The pools are nothing short of awe-inspiring. 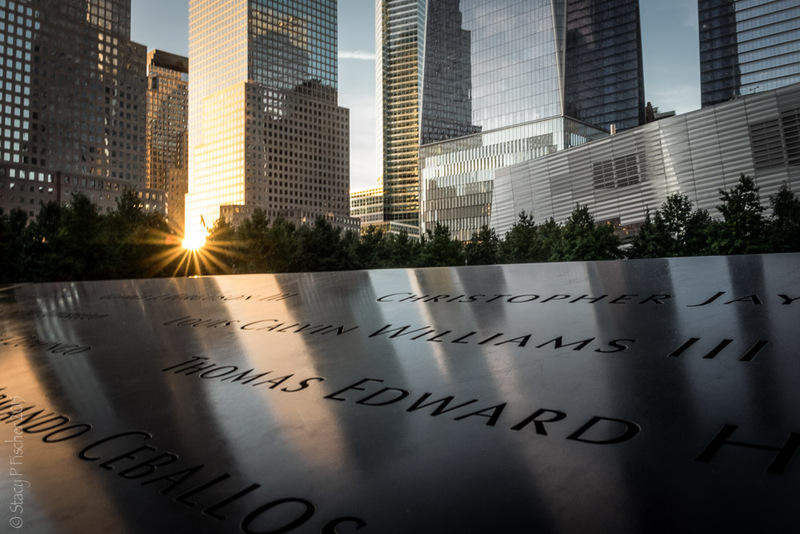 Named Reflecting Absence, the design — two large voids containing recessed pools set within the one-acre footprints of the Twin Towers — was the winner out of 5,201 entries from 63 countries in a competition to design a memorial at the World Trade Center site. Symbolizing the loss of life and the physical void left by the attacks, the pools feature 30-foot waterfalls (the largest man-made waterfalls in the United States) flowing downward into a central abyss. 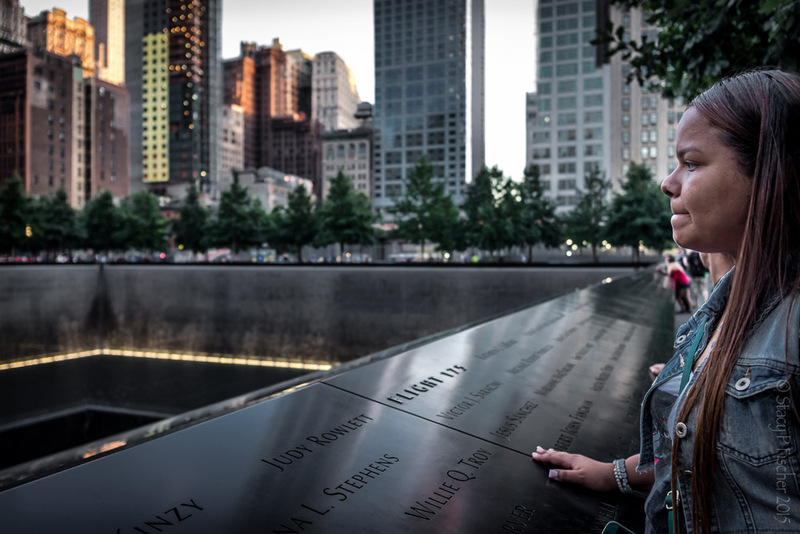 Seventy-six bronze plates surround the walls of the pools and are inscribed in stenciled cutouts with the names of the 2,983 victims (2,977 killed on September 11 and 6 killed in the 1993 World Trade Center bombing). …. The names are arranged according to an algorithm, creating “meaningful adjacencies” based on relationships—proximity at the time of the attacks, company or organization affiliations (for those working at the World Trade Center or the Pentagon), and in response to about 1,200 requests from family members. The names of the employees and visitors in the North Tower (WTC 1), the passengers and crew of American Airlines Flight 11 (which struck the North Tower), and the employees and a visitor of the 1993 World Trade Center bombing are around the perimeter of the North Pool. The names of the employees and visitors in the South Tower (WTC 2), the passengers and crew of United Airlines Flight 175 (which struck the South Tower), the employees, visitors, and bystanders in the immediate vicinity of the North and South Towers, the first responders who died during rescue operations, the passengers and crew of United Airlines Flight 93 (which crashed near Shanksville, Pennsylvania) and American Airlines Flight 77 (which struck the Pentagon), and the employees at the Pentagon are around the perimeter of the South Pool. Company names are not included, but company employees and visitors are listed together. Passengers on the four flights are listed under their flight numbers, and first responders with their units. Viewing the pools is an emotional experience, made even more so as the golden light of the afternoon sun gives way to early evening shadows and the lighting of thousands of LED lights. The beautiful glow of the waterfalls from the lights at the base of the pools is echoed in the glow of the names of the victims from the lights underneath the bronze plates. The sounds of the city are left behind, replaced by the sound of the cascading waterfalls. It is easy to get lost in one’s thoughts here, contemplating the names and the lives of those lost, of an America pre- and post-9/11, and of the resilience of New York City. If ever in Manhattan, I urge you to visit this memorial — photographs truly can not do it justice. 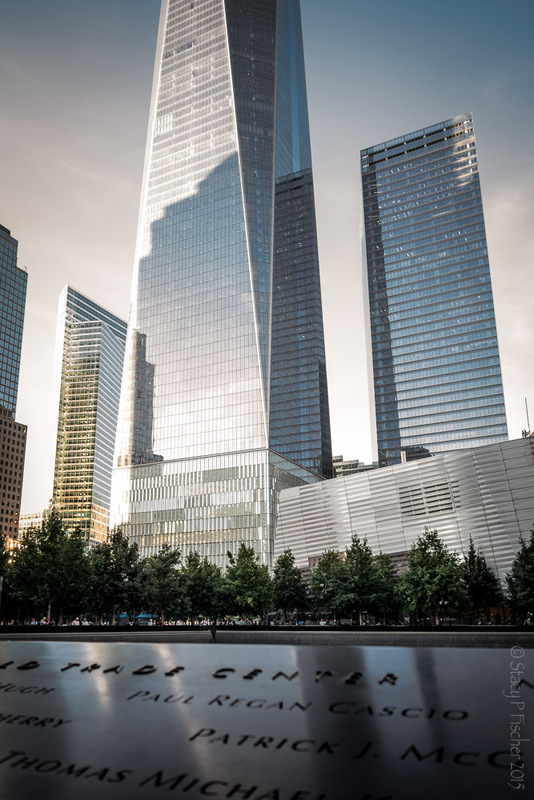 This entry was posted in Architecture, New York City, Places and tagged 9/11, design, Manhattan, memorial, New York City, photography, postaday, World Trade Center. Bookmark the permalink. Thanks so much, Kaz! I’ve been wanting to photograph it from golden hour into dusk for such a long time. When Robin said he was going to be there, I didn’t hesitate with “may I join you:?” It’s also quieter at night than during the day, which helps in capturing the more sombre mood. Wow! These images are beautiful. Thank you for sharing! I hate to even admit this, but this is my first time ever seeing this memorial. It brought tears to my eyes just viewing your pictures and reading your words. I imagine that the impact is even greater in person! Kirsten, I’m sure you’re not alone in never having seen it. I’m honored to be the one who introduced it to you. And you’re so right – the impact in person is far greater! A fabulous series of images, Stacy. And thanks for putting together the background information. I particularly liked the second image showing the emotional response of one of the visitors. I have been there several times and have yet to capture anything so expressive. Very well, done! Thanks so much, Robin. Right place, right time. I can’t wait to see what you captured there, especially with your full-frame Nikon! Beautiful photos and thoughts. Thank you for sharing the information as well. Thanks, Nicci. And you’re very welcome. Some photos definitely cry out for a narrative. Beautiful and so very evocative. I hope to visit there soon…was there months after the attacks when all the messages and memorabilia were still hanging on the fences around the rubble…it was all too much to bear. Thanks, Susan. I do hope you get there. I can only imagine how emotionally raw it must have been to be there so soon after the attacks. You’ll be amazed by the transformation, even as it continues to move forward with the transit center and surrounding buildings. Beautiful photos Stacy. What an experience it must be to go there. The idea of the city sounds being replaced by the sound of waterfalls is amazing. Thanks, Desley! The thought and creativity that went into the design and the symbolism behind each element just take my breath away. I can only imagine. I’ll have to get there one day! I hope you do get the chance! Beautifully captured Stacy! I especially love the last image – the light is brilliant! Thanks so much, Robyn! That last photo is actually a merge of five different images I took with my little Fuji 🙂 I’m looking forward to seeing what Robin got with his full frame Nikon! Your images of the memorial are beautiful and evocative. It’s impossible to stand there and not be moved by the memory of what happened that day, not feel the reverberation of that tragedy, and I think your photos capture and convey something of the scope of what it feels like to be there. Laura, you’ve beautifully written in words what I tried to convey in the photos. Thanks so very much for that. Very emotional images and writing. I will visit whenever I get back there. Guaranteed! Be prepared to spend a bit of time, Emilio. The pools themselves can take an hour or two; the museum, an entire day. In fact, I’m going back for a day to finish touring the museum – it’s difficult to take it all in in one visit. These pools are breathtaking Stacy. They truly are, Chris. I’m awed not only by the creativity of the design, but by the engineering behind it. Truly amazing! Thanks, Sherry. I was so pleased to have the opportunity to see the memorial as day turned to night. It brings another level of emotion to the experience. Thanks very much, Enis. To fashion such beauty out of such horrific destruction makes the memorial all the more poignant.